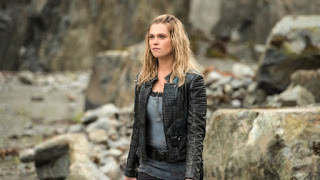 Heading into the midseason, The 100 is still going strong with “The Tinder Box.” But things aren’t looking too hot — or maybe they’re actually looking VERY hot, depending on your perspective — for basically anyone on the show thanks to Ilian. Can we truly call him misguided? Because he truly annoys the crap out of me. The episode begins with Octavia falling off Helios in the middle of the woods. Ilian conveniently finds her (was he following her?) and brings her to Arkadia, where she is able to warn Clarke that Azgeda is coming. Clarke and Monty immediately bolt off to make a plan, and in the first genius move of the night, leave Ilian alone in a ship filled with tech. Clarke is convinced this is all some huge misunderstanding and that she can fix things by talking to Roan. In the war room, Monty and the team come up with a surprise attack that will allow Clarke to speak with Roan — hopefully unharmed. Enacting the plan, the team cuts Roan and the Ice Nation off from their path to Arkadia. Clarke is flanked by about snipers in waiting. She asks Roan to talk, but he says it’s too late. Roan then angrily orders that his hostages Kane and Bellamy be brought forward. Clarke, obviously thrown off by the presence of the hostages, asks for ten minutes of Roan’s time. Echo is worried it’s a trap, but as Roan points out: “It is a trap. We’re already in it.” I love this man. This leads to the second genius move of the night: Miller’s dad tells everyone to let the king pass so that Clarke may talk with him. But dear old sniper Riley isn’t letting up. Because why wouldn’t they bring the kid who was just enslaved by the Ice Nation along to a peace talk? That sounds like a brilliant idea. Luckily, they’re able to talk him down; but it’s obvious this isn’t the last time this issue is going to come up. Clarke and Roan talk in the cave, where Roan tells her that he knows about the ship. Clarke tells him it can only hold one hundred people. She then explains that nightblood is the cure and they will turn everyone into nightbloods — that’s how they’ll all be saved. Roan isn’t a big fan of this idea because, you know, science. Clarke and Roan then come to a compromise — instead of Arkadia getting one hundred people, they’ll split between their nation: fifty from Skaikru and fifty from the Ice Nation. This is going to go over well. You know what is also going over well? Riley has broken ranks and has followed Clarke and Roan, intent on killing the king. Bellamy believes he can talk Riley down, so Monty exchanges places with him as a prisoner of the Ice Nation. Bellamy and Echo rush to find Riley before he ruins everything. Luckily, Bellamy is able to talk him down, while Echo keeps her bow and arrow trained on his face. At least all’s well that ends well. Meanwhile, Octavia wakes up in Arkadia and is being taken care of Niylah. Sidenote: I love Niylah! She tells Octavia that Ilian rescued her and brought her on the ship. Panicked, Octavia immediately realizes the ship is full of tech — heck, the ship itself IS tech! The duo search the ship for Ilian, but it is too late. He has apparently accumulated, without being noticed, all the Ark’s gasoline and brought it in the engine room. He’s ready to blow up the whole ship. Octavia can’t talk him out of it, and boom goes the Ark. Clarke, Bellamy, and the crew all return just in time to watch in horror as their safety boat burns to the ground. But at least Bellamy and Octavia are reunited? The look of absolute relief when Bellamy figures out she is alive is one for the books. Back on Becca’s island, Raven has a seizure. Abby and Jackson immediacy go to wake her up. Apparently, a part of A.L.I.E. is still in Raven’s head because of the way they used an EMP to melt her chip. Now her brain is working too fast for her body to handle. Great. But thanks to the super brain, Raven figures out how to make the nightblood — and how to get there, too. We’re going back to space! And that’s where we end! I am not looking forward to a bunch of people dying of radiation poisoning. Is Abby’s brain about to get an upgrade? ALSO, SHOW: STOP HURTING RAVEN!